A fun, quick dinner before the Trick-or-Treating begins! Unroll pie crusts. 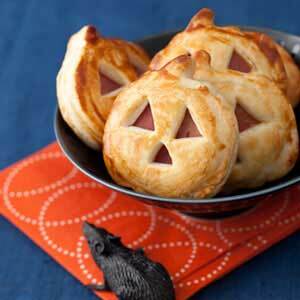 Cut each crust into 24 pumpkin shapes with a 3-in. pumpkin cookie cutter. Using a 1/2-in. triangular cookie (aspic) cutter or a sharp knife, cut out eyes and a nose from 12 of the cutouts.